NOVEMBER 10--As part of an apparent hazing ritual, an Iowa fraternity pledge consumed so much booze that his blood alcohol level was nearly .500 when, barely breathing, he was admitted early Sunday to a Des Moines hospital. Nate Erickson, a 19-year-old Drake University freshman pledging the Phi Delta Theta fraternity, was found unresponsive at a home used by the frat, according to this Des Moines Police Department report (which was unearthed by the Times-Delphic). Erickson's mother told cops that her son had sent out text messages "stating that 'they' were making me do full cups of Everclear and that he had already done 5 beer can shots." 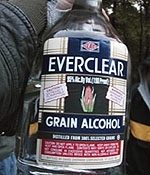 Everclear is a grain alcohol with an exceedingly high alcohol concentration. Jacqueline Erickson, who reported that her son also texted "I'm gonna die," told an investigator that she was concerned that he "was possibly forced to drink the alcohol as part of a hazing ritual." The incident is being investigated by Drake officials as well as Phi Delta Theta's national leadership.